They are forever elusive to me. I wish so much I could have known them better. To be with them — if only for a while. Two remarkable women who were robbed of life so young. Their short lives were rich; their endings sad. 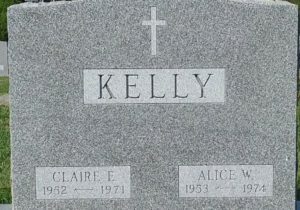 Remembered by all for their beauty, brains and bravado, my elder sisters Claire and Alice Kelly were 19 and 21 respectively when cruel fate took them from us. Since their passing I’ve learned that sibling ties can be the longest-lasting and most-satisfying human relationships. There are so many opportunities for amazing friendship and life-altering forgiveness. Even a short one, when ended, must have an impact. My sisters were lost in two tragic auto accident deaths — barely 1,100 days and 2 miles separated the misfortunes. Both deaths made the front page in our local newspapers, with my ill-destined father most identified as “a prominent Red Bank physician.” Many who know the events still seem haunted by them even some five decades later. As to fateful Monmouth Beach connections, ironically enough, the first official history of the borough, Monmouth Beach: A Bicentennial Publication (in 1975) written by Rosemary O’Brien, was dedicated to my two sisters. She knew and loved those girls. Drawing inspiration, I authored the second borough history, Monmouth Beach: A Century of Memories (in 2009). My sisters were Irish-twins, born 355 days apart. I’m uncertain of the grades attended or completed by my two sisters but I have seen photos of them as young students at the Monmouth Beach School. In later years, my parents sent them off to the Star of the Sea Academy in Long Branch. 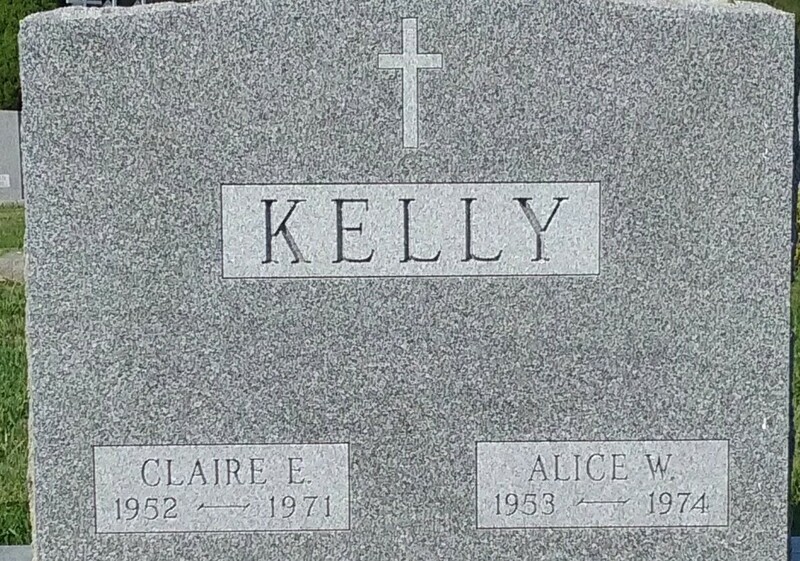 Both Claire and Alice would graduate from Red Bank Catholic (RBC was a high school all five Kelly sisters attended at one time or another). 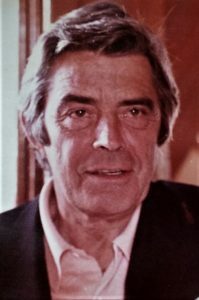 During those years my father, Dr. Charles W. Kelly, was in his prime as a skilled and successful physician and living an exceptionally good life. Kelly family times were most content. The 10 of us living in a stately old mansion on the Jersey Shore. Back then as the 1970s were unfolding, it was the stuff of dreams. It wouldn’t last. Claire Kelly at MB School, 1958. The oldest of our family’s 8 children, Claire Elizabeth Kelly was born on November 6, 1952 in Brooklyn, NY. Before she was 2, our parents had left NYC for Monmouth Beach. Growing up Claire had a lot of advantages. But being a child of the 1960s, she was every bit the rebel of that generation. Our family’s first born was decidedly free spirited. One friend, while very fond of her, told me that Claire liked to “play the bad girl” sometimes. Claire packed a lot into a short life. She was a beach bum who liked to get around in bare feet, loved to read and quoted Shakespeare in her RBC yearbook profile, and liked to party but wound up turning state’s evidence on a Long Branch drug dealer. All before age 20. One of her best friends told me that her father adored Claire, saying he “never met a happier girl.” He would learn of her death via the local radio. Another childhood friend, who visited our big old house for girl’s sleepover parties, remembered Claire as very funny, kind of wild and worldly beyond her years. Obviously a smart kid, and nearly as obvious, a reckless one, Claire was one to push boundaries. She drove our parents mad (falling off the smoking bandwagon being their go-to choice in tougher times) but they couldn’t help love her passion for life (I witnessed enough warm connections between them to know). 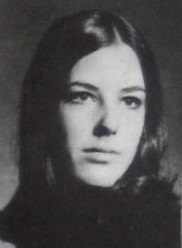 On November 7, 1971, while out celebrating her 19th birthday, Claire was involved in an awful car wreck. Her death was particularly gruesome. She was riding in a group of three young friends around 1 am when their west-bound vehicle lost control and hit a tree along Rumson Road in Little Silver. The speeding car struck the tree with such force it split in two; the half’s coming to rest some 150 feet part, according to a Red Bank Register news report. Skid marks stretched more than 350 feet from the point of impact, the police said. The accident scene was near the Little Silver-Rumson boarder line with the careening car also knocking down a Little Silver borough sign. The male driver survived but my sister and her boyfriend both riding in the back seat were killed, probably instantly. The two young men were both from Overton Place in Long Branch; no one in the car had yet reached age 21. The accident effects on Claire’s body were catastrophic. 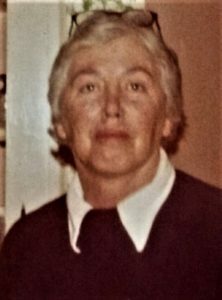 My uncle, Dr. George Sheehan, who was the Riverview Hospital ER physician that night, did not recognize her mangled body. Claire Kelly at RBC, 1970. For delivering the horrible news to our family, the task fell to one of our beloved aunts who lived in Monmouth Beach on Shorelands. My mom’s younger sister, she awoke my parents to tell. I can only imagine the misery while admiring my aunt’s courage. My own last words to Claire were the laments of a young brother who didn’t get her a birthday present that day. With an understanding I now treasure, she gave me a final smile and a hug. I never saw her again. Burnt into my memory forever is the next morning when my dad awoke me to tell of the deadly accident. To this day, I don’t know how he did it, telling his two youngest sons (my 9-year-old brother Charlie slept on my floor that night) so dreadful a story. During his long medical career, dad delivered lots of very bad news, but I don’t think he ever faced a more gut-wrenching task then on that fall morning. And what I remember most is that he did it all while in a suit and tie. I believe it was his stab at normalcy — on the worst day of his life. Alice Ward Kelly was born on October 27, 1953 at Riverview Hospital in Red Bank, NJ, when by then our growing family had moved to Monmouth Beach. She too had a charmed life as a youngster. Alice was a good Catholic girl (embodying their teachings of hope, compassion, love, and faith) who rode horses (displaying elegance with flair) became a very good nurse (our doctor dad said she did it all on her own), and had designs on going to medical school (perhaps she could have healed our family?). All before age 22. 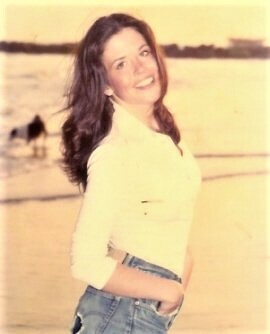 Alice Kelly at the beach, early 1970s. Alice was a beautiful person inside and out. Statuesque, you could call her. So many others were drawn to her vitality (young men in particular easily fell in love with her, and retain it today!). Whip smart, strikingly gorgeous, and willing to challenge herself, it looked like Alice had the world in her hands. We all think Alice was our dad’s favorite and when she went his pain must have been indescribable. She was living in Monmouth Beach at the time of her death — renting a house once owned by the 19th century actor Oliver Byron on Riverdale Avenue near the Long Branch border. 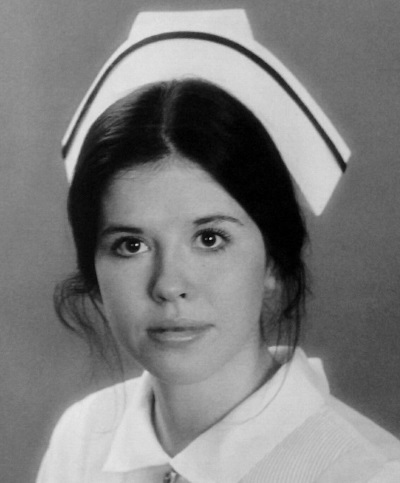 At mom’s request, Alice was going to Riverview Hospital that fateful night to pick-up our sister, Sheila, who was doing her own good deed working as a Riverview ICU clerk. Alice had a lot going against her that night. She was operating an unfamiliar car (might her own late-model but hulky Mercedes-Benz have protected her?) and was driving into a major coastal rainstorm (80 mph winds and flooding would put real hazards in the direct path of her vehicle). A little after 8 pm on December 1, 1974, Alice was driving a convertible sports car (owned by a boyfriend) when it skidded on a rain slicked road and hit a utility pole on River Road in Fair Haven. Police deduced she lost control at the S-shaped curve section of the road near the Shrewsbury River Yacht Club. The force of the impact sent her through the windshield. For another sister, it seems death was instantaneous. I’ll never forget the evening when my father got the phone call learning of the death of a second child. Thanksgiving came late in 1974 and the family was mostly around the house for that weekend. I can still hear it today — dad’s “No!” scream and the sound of the phone striking the kitchen floor. Overwhelmed with misery, later I would hear him say: “I can’t get one of my children to live past 21.” The funeral was a blur to me other than recalling the long line of pretty young ladies crying on my older brother’s shoulder (for the second time in three years). Upon her death Alice was showered with praise by hospital nurse colleagues and physicians on staff. Calling her a “new breed of nurse,” they said Alice was someone who could “see the big picture” and wanted to “save lives and save people.” The president of the Riverview medical staff, another Monmouth Beach doctor, commended Alice for her exceptional touch with patients. Today, the two sisters rest in Middletown, NJ at Mount Olivet cemetery. They are buried there with our parents. No room for anymore Kellys. I hadn’t even reached my 15th birthday by the time these horrors had struck; I was only a kid. My strongest feelings go to sadness. For myself, but more, for my parents. In watching their behavior then and in the following months and years, more than anything else, their sorrow came through to me. And in many ways it shadowed our family. In truth, our sister’s deaths brought us more freedom as children. My parents were more willing to overlook laziness and/or bad behavior for fear of damaging anyone of us left. What I can’t say is that this freedom helped us move on toward acceptance of what happened or recovery from it. We all suffered. Some just handled it better than others. My father who was already busy growing his medical practice, threw himself into his work even more. If that’s at all possible for a doctor? He drew strength by helping others but some resentment for not always helping his own. It was how he coped. Ultimately, he would gain the “holy grail of medicine” — complete trust and influence with his patients. The deaths certainly had a far more profound impact on my mother, Joan (Sheehan) Kelly, who didn’t have the all-consuming and ready outlet that my father did. The first death knocked her down, the second one knocked her out. The light in her life was extinguished. The damage was shattering. I watched and heard as she drank and/or cried herself to sleep more than a few times; Dad never once. Her down times could be heartbreaking and unsettling. Observing the throes of emotional agony she went through some nights rattled me to the core. Being barely a teenager, I didn’t know how to help her, even as I sensed she was beyond any true repair. Today, I feel shame for the anger I had for her showing her real agonies. I know now that life doesn’t get any rougher — inflicting so much hurt on a loving mother. Only later would I find solace in learning what a gem she was. More than a few Monmouth Beach women have told me that her photo rests on the table beside their bed — so attached were they to her brilliance. And furthering the evidence of her golden touch with people. I now remember her fondly and always for her clever nature, love of laughter, understanding of style in all things, fierce loyalty to her family and friends, accepting and discreet generosity, and her always looking out for the underdog. Multitudes of Monmouth Beach friends and families have told me of my mom’s unwavering support and encouragement when they were challenged. I heard how she backed them when no one else would. A very impressive lady all around. A tell-tale sign of her grandeur: all 13 of her siblings adored her. No small task. I have a theory: “if you know your mother loves you then you’ll have a mostly satisfying life.” In that very important sense, my mom was a success. What I don’t recall from those times is anyone asking me if I was okay or reassuring me that everything was going to be okay. Not one time. Pretty sad for a young boy. And neither of the two school systems I attended during these events were equipped to deal with these serious matters. With one or two notable exceptions, they were not helpful or considerate. Today the system is very different — schools shutdown for grief counseling when things like this happen — and rightly so. The Kelly kids probably would have been well served with some attention back then. For me, I can’t say there was any real grieving, no real communication about it, no real feelings about it. Truly. We just didn’t discuss it. I can’t say I ever had a conversation, good or bad, about my two sisters with my parents. Not one! While frequently told “that’s what the Irish do,” I now feel that it took too long for me to realize how mistaken it was to handle it that way. Even if you’re not sure what to say, you should be encouraged to at least try to say something … anything. Among my siblings, and I’m not alone on this, we didn’t really feel it. Or we did and ignored it. Enabling a sadness to later manifest itself in each of our lives and in many we touched. I don’t ever resent my parents for not knowing what to do back then. They were broken themselves. I had to become a parent myself to truly understand their anguish. My own two children have countless lovable qualities. They are smart, funny and decent human beings. I always want to be with them and every moment I get I treasure. They fill my heart with hope every day. It’s easy to believe in God knowing he gave them to me. They are irreplaceable. That my parents twice endured losing that which is irreplaceable, stayed together, and raised the rest of us, still inspires me today. Whatever their personal flaws, I’ll always love them for holding the family together during such dark times. We learned that life goes on. Survival was a choice. Greg, I do remember those accidents, my sisters were very close in age. I can’t conceive what this would have done to my family. God Bless! Greg, this was such heartfelt writing about your beloved sisters and your family, and your sisters, Claire and Alice. I remember Claire and Alice from RBC, very well! They knew everyone in the school and we all knew the Kelly family. Claire and Alice were fun, funny, pretty and smart. They both had great smiles and beautiful shiny dark hair and were friendly to all. I remember hearing of the accidents within a year’s time, and feeling heartbroken for your entire family. In 1972 our family lost our oldest brother to a construction accident after Donnie just turned 27. I was 21. As your family, this tragedy redirected our lives, sometimes teaching us about life, sometimes suffering from the loss of life. Like you, the agony and pain the parents had to endure, while raising the other children, was most unbearable. Back then, the plan was to put one foot in front of the other and keep going. They didn’t have the support systems in place, as we have now. Thank you for sharing and please know that Claire and Alice are not forgotten. When I spend time with our former fellow Red Bank Catholic classmates, the names of Alice and Claire Kelly come up, with great memories and laughter. They were beautiful young women, in so many ways. Love to all the Kelly family! I’m sure if we saw your children and your sibling’s children, we would ‘see’ the faces of your beloved sisters. Life does go on, but we always carry the ones we left behind, in our hearts. Bonnie, my brother posted this and initially I didn’t recognize the names but decided to read the article. First I remembered the accidents and then I remembered the girls. And I thank you for your beautiful post and making me remember both the girls and I did not know about your brother then. Thanks again. I lived only a couple doors away and was probably 6 or 7 at the time. Claire, Alice and Mary Reaves were all about 12 or 14. I didn’t have anyone to play with so the 3 of them would let me tag along. How sweet and kind they were. It lasted a couple of weeks but I will never forget it. What a beautiful memorial to your sisters. I was in Claire’s class at Star of the Sea Academy. We were best friends and called ourselves “sisterbelles.” She also had a nickname for your mother, “mommaleskalu.” Hope I spelled that right, but that’s how she pronounced it. We loved the girls’ sleepovers at the big house. I remember how impressed we were when Claire and Alice opened boxes sent from Best and Company in New York City and took out matching Christmas outfits. Pink velvet pants and tops. Very chic for the 1960s. I went to Red Bank Catholic, too, but Claire and I went our separate ways, but whenever I saw her in the halls, I couldn’t help but smile, remembering our days at the Academy. Our 5th grade teacher, Sister Ann Noreen knew that Claire and I were best friends and encouraged us to read books together. We read Jane Eyre, of all things. Our group included, me, Sharon Williams (now Hazard), Kit Faust, Susan Maloney and Eileen Desmond. I can still see the mysterious balcony that connected the two wings of your beautiful home on Club Circle. What a wonderful tribute to your sisters. I graduated from RBC with Claire. We did not travel in the same circles in school so I did not know her well. I was working at Riverview when I heard about her death. I remember both your father and Dr. Sheehan walking in a daze around the halls afterward. I knew your sister Alice from working at RMC also. I knew her as a very dedicated individual who took the utmost care of her patients. The hospital was once again crushed by her loss. My parents are at the top of the hill from your family’s grave site at Mt. Olivet. So when I visit them I always drive by the Kelly monument and say a prayer. So sorry for your great loss. Greg your story is heart wrenching. I was 19 and working at Riverview when both of the accidents took place. I was also the neighbor and grew up with the two guys in the car that Claire was in. That accident haunted me for many years and also working at Riverview I knew your dad and your uncle and it was so evident in there faces the pain they were going through. I’m so sorry what you went through at such a young age. Greg, I had moved away from Monmouth Beach by the time Claire and Alice graduated from high school. They were very dear to me; once in awhile I came to babysit for them and as you know, our mothers were best friends. My daughters are named Jessica Claire and Katherine Alicia for your sisters. Sadly, I remember this tragic time well, and the photos bring it all back into focus. The Kelly’s, along with ours, were one of a few large families to move to Monmouth Beach in that time. My sister attended the Academy with your sisters, then RBC for a while, and the boys went to Star of the Sea Lyceum then CBA (with your cousins, who later had their own story to tell). The shock of the first and the devastation of the second, words could never describe. I hope your family is doing well and has been made stronger, a strength I can not even imagine. Greg our families were always close. As large Irish Catholic families from the ti-state area there were relationships our parents had or our extended family members had with each other dating back to their grammar schools, high schools or college years. 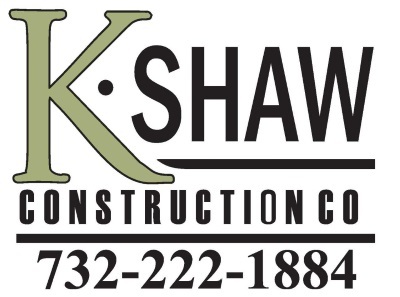 It was kind of kismet that the Kellys, Murphys, Sheehans, Hoags, Hincks and many more all ended up in the little communities of Monmouth Beach and Rumson. We/I loved your entire family and still do. I was close to Alice in high school even though she was two years older then me. We had great times sitting on the beach in Monmouth Beach and driving around in her Woody Station Wagon the summer of 1972 or 1973 not quite sure the exact date, but we had a lot of fun that year! I miss our childhood days in Monmouth Beach before the tragedy of the accidents that changed somethings for ever. This article was very bitter/sweet. I feel strongly that you should continue this family story. I for one would love to read more. You are a gifted writer.